While many animals are able to fly, birds are the creatures that have mastered flight. They evolved feathers and an aerodynamic body shape. But how exactly did they evolve the ability for complex flight? Were birds first capable of gliding then modified this advantage into powered flight? Or did they begin flapping their wings while running and evolve flight in this manner? Proponents of flight from running, such as Kenneth P. Dial, observe the behavior of chukar partridges (Alectoris chukar). Chukar partridges display wing assisted incline running (WAIR), meaning that both young and adults beat their wings vigorously while running up inclines. This motion creates a net aerodynamic force which pushes the bird into the incline, causing greater traction in the hind limbs. Dial argues that this behavior points towards the origin of flight in birds coming from the ground-up. However, there is no evidence that says whether WAIR evolved before or after powered flight in birds. Since WAIR is useful to the young of chukar partridges, it is possible that this behavior evolved to assist the birds before their wings developed and is unrelated to the actual origin of powered flight. Assuming that all birds evolved from a common ancestor means that powered flight had to evolve only once and continue to be modified from then on. Fossil evidence points to the evolution of powered bird flight from gliding. 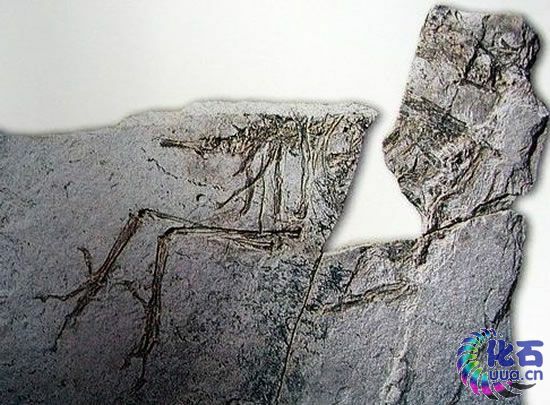 The recent discovery of a fossil of a creature deemed “the microraptor” had scientists reeling. This is a dinosaur (dinosaurs are widely accepted as the ancestor of birds) that had feathers on all four limbs. How could this creature have possibly used the feathers on its hind legs? Several models of the animal were made and placed in a wind tunnel at MIT. The lift and drag forces were measured. The configuration that produced the most lift and least drag came from when the hind legs were stretched behind the bird, and the feathers of each leg tilted towards each other, creating a canopy. This is the position that the animal probably assumed after leaping off of a branch. Furthermore, as the microraptor brought its feet into a landing position, drag was increased which slowed the animal down enough to make landing successful. The data collected from the model in the wind tunnel, specifically the high lift and low drag during the time in the air, showed that this creature would have been a very successful glider. Modern avian flight is believed to have evolved during the early Cretaceous period though the fossil record so far has not provided much evidence of this. 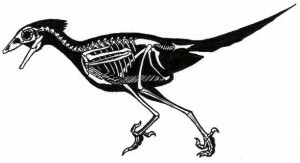 However, the discovery of Sinornis santensis has provided more insight. Sinornsis is a bird that possesses many morphological similarities to features once believed to be unique to the Archaeopteryx, a dinosaur that is capable of gliding or primitive powered flight. These similarities include, a short toothed snout, separated carpus and manus, erect iliac blades, and well-formed phalanges. However, Sinornsis also possesses more advanced characteristics which point towards modern avian flight and perching, including no more than 11 dorsal vertebrae in the trunk and a short tail. This resulted in the Sinornsis shifting its center of mass towards the hind limbs like those in modern powered avian fliers. Other features show that the Sinornsis probably had a modern wing folding and flight stroke. This bird could possibly be a link between gliding and powered flight in birds. In conclusion, though fossil evidence is usually debatable and open to interpretation, more and more evidence is appearing which points the ancestry of avian flight towards gliding. 1. Early Evolution of Avian Flight and Perching: New Evidence from the Lower Cretaceous of China. Science Magazine (Vol. 255). February 1992. 2. Wing Assisted Incline Running and the Evolution of Flight. Science Magazine (Vol. 299). January 2003.